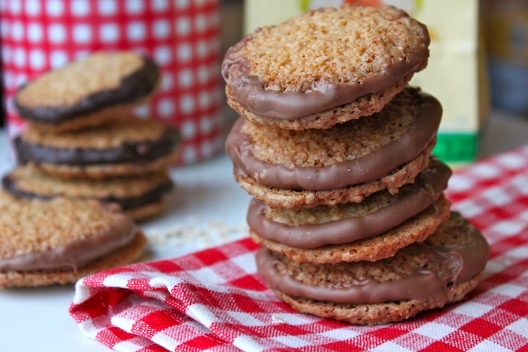 Double Chocolate Crisps (Havreflarn) Macnifique! errrrrr…… you said what now!? So, quite a few months ago – maybe even a year ago, Mo’s mom had bought a box of these strange looking biscuits/cookies. 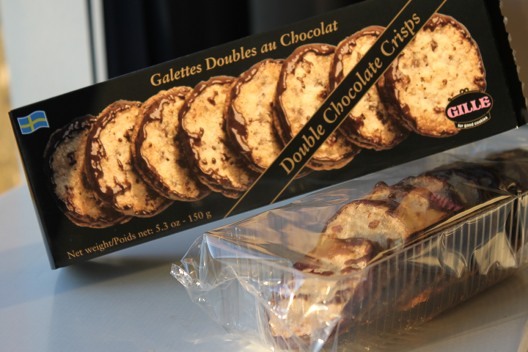 The box called them ‘double chocolate crisps’. I was intrigued, but not overly excited. I don’t tend to get all that excited about biscuits and the like. One bite of these babies and I was hooked! I could have eaten the entire box! Thankfully I was in company, and totally lacking in chutzpah. 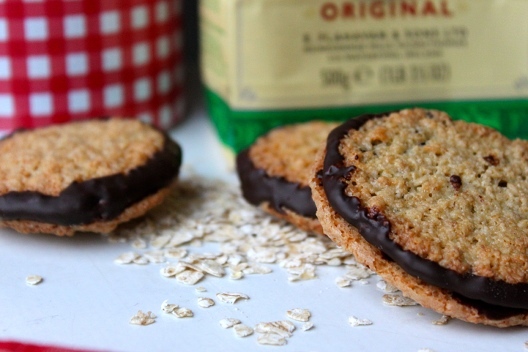 They were incredibly crisp, totally delicious, oat-ey with and almost nutty flavour (although no nuts are mentioned in the recipe) and a generous amount of chocolate adhering the 2 halves together make them rich and totally decadent, the perfect partner to a cup of tea or coffee. It was on that day, I decided that these were my favourite of all store bought biscuit/cookie confections. Being the lover of baking that I am, I finally decided to take it upon myself to attempt to recreate these gems! I knew (from the packaging) that these were a Swedish biscuit. But I had no idea what the Swedes called these, or how to find a genuine recipe. I was largely helped along, by Clotilde of Chocolate & Zucchini who started off a search for a recipe (in 2004) by asking her readers if they knew of any. The contributions range from 2004 up until 2011 and there were a few different suggestions mentioned. 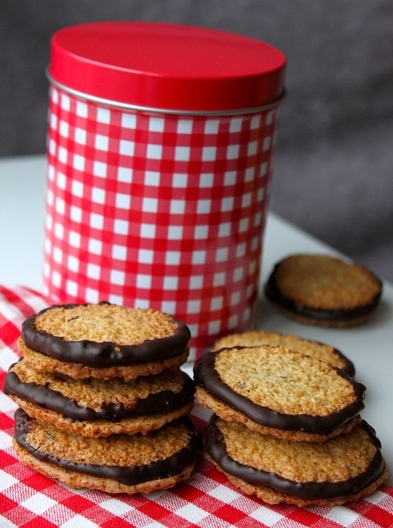 What I found largely beneficial, was discovering the Swedish name for them, HAVREFLARN, which allowed me to search further for an appropriate recipe. It comes as no surprise to me that there was a vast array of recipes online. Some were similar, some identical and some quite strange. My first attempt used one of the more simple recipes (including syrup in the mix). It produced a very tasty, but highly textured cookie whereas the boxed version has a lot less texture. 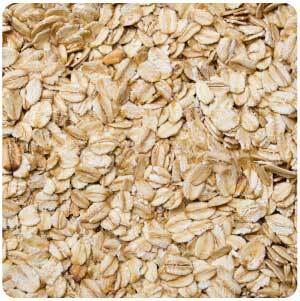 I then decided to try processing the oats – with disastrous results! They turned out crumbly and dry. I decided to try a half recipe, see how it turned out, and in my rushed attempt to throw the mixture together, I made a few little errors. Firstly, the whole recipe calls for 1 egg, instead of using half an egg I threw in a whole one, making the mix rather wet. Secondly, I also failed to use half the amount of sugar. I’ve never claimed to be a genius! I spooned a few dollops onto a baking tray anyway, and was quite pleased with my results! They didn’t look quite as refined as the boxed cookies, but they had a similar crunch, just not quite as nutty in flavour. Maybe the people over at GILLE toast their oats? So in some ways, I guess I developed my own recipe, and despite the doubling of sugar, they weren’t overly sweet. Woohoo! 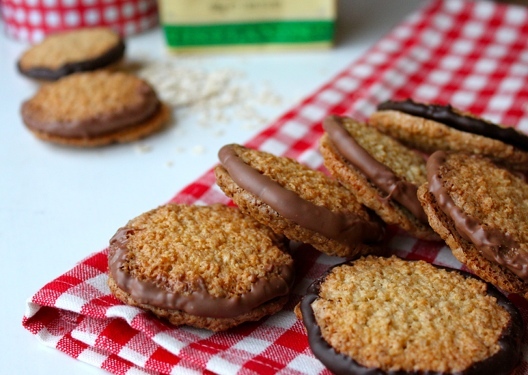 Combine oats, sugar, egg and melted butter. Sift in flour and baking powder, and mix through. Wet the back of a teaspoon and gently flatten the balls, they will spread, but this should allow them to spread evenly, reducing a dome in the centre. Place trays in preheated oven and bake for 7mins, then turn trays, and bake for a further 3-4mins. They should be a nice even golden brown so you may have to adjust your timing to suit your oven. Once ready, place onto a cooling rack. 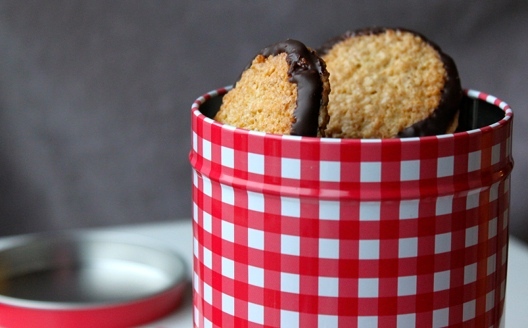 Chop chocolate finely, and melt either over a bain marie, or very gently in the microwave. 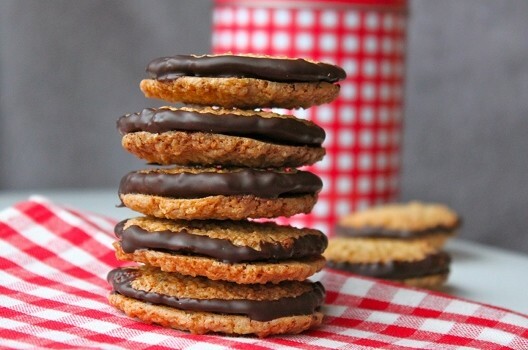 Once biscuits are cool, and chocolate is melted, dip the underside of once, and then place another underside onto the chocolate, adhering the two together, leave to set. If you are impatient like me, stick them in the fridge to set. Pour yourself a cold glass of milk, or pop the kettle on and make yourself a brew. When I made this batch pictured, I was feeling a little experimental, and decided to try some with milk chocolate. 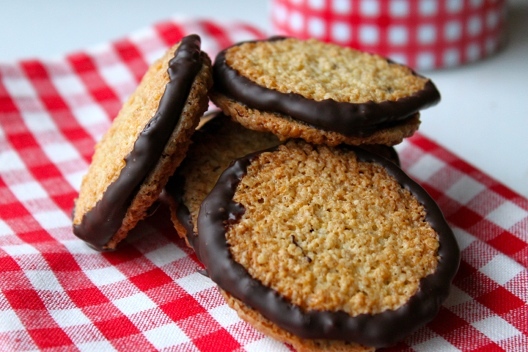 They were good, but I think part of the charm of these biscuits is the intensity of the rich dark chocolate, paired with the warm nuttiness of the crisp, oat-ey biscuit. I feel like maybe I could have refined this recipe a little further, but I’ll leave that to another day. I’m pretty certain this is a recipe I’ll come back to! Hmm… Think I’ll go get myself that glass of milk – these things aren’t gonna eat themselves! mmmm… I am in Sweden and I am eating copious amounts of these as we speak.. Göt!!! mmm cant wait to try them! Hi Friva! I hope you enjoy making your Havreflarn! Let me know how they turn out! bonjour combien de grammes faut il en farine? ca me semble super délicieux merci pour votre partage. Awesome! I’ve been looking for this recipe for a long time! but still they are not coming how i expected… i usually use two baking pan, the one on the top comes out super dry.. the one on the bottom get all creamy and bubbling like foam… and when i have to turn them… they are still too soft! its impossible to turn them without destroying them.. should i keep them out of the oven a while until they solidificate? should i grind the oats? Hi Bruce, I'm sorry your cookies aren't coming out as you would like. Unfortunately most ovens (mine included) don't keep an accurate temperature reading and often the top shelf will be a lot hotter than the middle and bottom of the oven. You may need to bake one tray at a time in the middle or bottom of the oven or take out the top tray earlier. Im confused as to why they are getting destroyed when turning them if you gently turn the tray you should have no problems. You also don't need to grind the oats. I Hope that was helpful. Bruce, it sounds like you’re turning the cookies, you’re supposed to rotate the tray so they bake evenly, don’t flip the cookies over. aaahh! So i don’t need to flip them to cook both sides? should i grind the oats or just use it as it is? maybe il get more crunchy? Ehi girls thanks for you answer, i never saw it!